engravings. Wood engravings are. . . . Here, let me show you. The exchange tends to be simultaneously frustrating in its repetitiveness, yet satisfying in the way my interlocutors’ faces light up at the sight of the images placed in front of them. Suddenly, the usual spiel is cut short, and words become superfluous. A lot has been written recently about language’s unreliability, with terms such as “post-truth,” “fake news,” and “alternative facts” populating many headlines. Words seem to have become too malleable, shifty, and unhinged, able to turn the world as we knew it topsy-turvy. As a response, visual artists who produced woodcut novels moved away from a logocentric approach to language, proposing instead a completely wordless vocabulary which relied solely on the power of black-and-white images. Since the distortive powers of language were often attributed to the technology which conveyed it, woodcut novelists turned to an ancient, organic material—wood—and to the oldest printmaking technique, the woodcut. The impetus behind crafting this new/old type of visual narrative was a sense of urgency which feels familiar. Woodcut novelists sought to create a pictorial language capable of transcending all kinds of barriers. While this idea of a universal language seems more idealistic today than ever before, we can certainly still resonate with the need for a language that is shared instead of mastered, a language that unites instead of manipulating, distorting, and breeding seemingly insurmountable differences. Researching and writing about the woodcut novel brought certain linguistic dimensions of my own scholarship into new relief. As a scholar, I can certainly relate to the woodcut artists’ impulse to craft discourse that is both highly accessible and innovative; as an academic who writes in English, but who is not a native speaker of English, I also sympathize with the many challenges these artists faced in coming up with this new kind of storytelling. Crafting and reading a woodcut novel relies on a process of defamiliarization; language is made strange before it can become familiar again, a process akin to learning a foreign language. Lynd Ward, Wild Pilgrimage, Courtesy of Wikipedia. Unlike comics, which rely on a mix of words and images, as well as on panels as a way of communicating information and organizing space and time, each page of a woodcut novel presents one individual image. Narrative is thus created by carefully balancing the general and the particular, the easily recognizable with the more epistemologically complex. Narrative conventions are not altogether abandoned, but re-appropriated. The end goal is to “achieve a sharing of feeling and understanding that cannot be explained in words or communicated in any but visual means,” to use Lynd Ward’s own words. This careful balancing act between the pressure to adhere to linguistic conventions and the need to make language one’s own characterizes my own experience as an academic writer. At the beginning of my academic career in the U.S, I struggled with what I perceived as a limiting, prescriptive approach to writing; my own Eastern European way of writing was circular, meandering, and instead of reaching a conclusion through writing, I felt I needed to hold all the answers before typing even a single word on the page, a paralyzing feeling which, needless to say, didn’t make me a very productive writer. 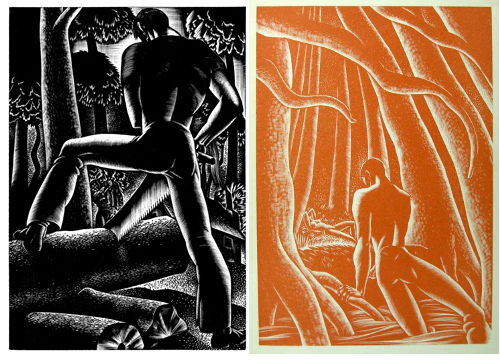 While years of practice and an increased sense of confidence have been essential, Lynd Ward’s theory of complicity with materials has also resonated with me as a writer. Instead of treating his artistic material of choice, the woodblock, as something that had to be subdued and transformed into a higher aesthetic form, Ward proposed the much more democratic and modern approach of acting or cooperating with the material. He allowed the wood’s knots, grains, and grooves to influence his wood engravings. Similarly, the process of academic writing in a foreign language and in a different style need not mean a subjugation of individual voice and its incongruities. The writing process becomes an opportunity to cooperate with linguistic instinct and generic convention. Ultimately, the goal is to embrace one’s voice within academic writing, as hybrid as it might seem. Like the woodcut novel, a type of visual storytelling which is not quite literature, not quite fine art, I like to think that my academic writing too resists an easy categorization.